The Candy Cane Express is about to get going again for the Christmas holiday season of 2012. 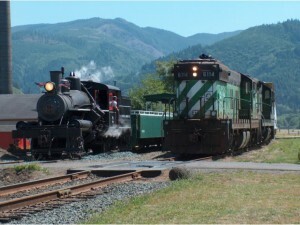 Running on December 8, 9, 15, and 16th this year, this is a fun train ride along Tillamook bay. The Oregon Coast Scenic Railroad trains are a classic look back at the trains that transported goods and people across the country. These relics are a way to not only learn about the history of the coast, but the chance to live it by taking a ride. The ride leaves three times per day from Garibaldi at 1PM, 3PM, and 5PM. The train rides costs $20 for adult passengers and $15 for children. The train gets decorated with lights, Christmas trees, and more holiday decorations. It is recommended to wear a set of warm clothing due to the likely hood of inclement weather during the winter, but regardless upon your arrival in Rockaway Beach, you can take some time to check out the shops such as the frugal crow or grab a bite and drink over at Rick’s Roadhouse. The train stops off right in the heart of town at the way station, so a quick walk on the beach can also be in order pending the weather for the day. Keep your eyes peeled on the train ride and you will enjoy the wonderful three grace’s rock out croppings just North of Garibaldi. Santa will be riding on the train and passengers of all ages are welcome to visit with him. Everyone will get a little bag of goodies with candy and cookie for the ride. This is a fun family activity and a way to enjoy this part of the coast from a different perspective. Instead of zipping by through the highway in a car, enjoy the slow ride and take in the beautiful sights of the bay, birds, and trees along the hills.